Water heater drip pan, installed at the same time as the water heater, catches drips. This should be piped to a drain. Buy a water heater drip pan on Amazon. Is your hot water heater leaking? If water is pooling near your water heater or dripping from the hot water tank or pipes, follow this expert advice for water heater leak diagnosis and repair. A leaking water heater can indicate any of several problems, ranging from loose valves to a corroded water tank. In fact, water pooling around your heater does not always indicate a leak—it can be the result of condensation. Here we will walk you through the appropriate steps to take if you see drips or pooling around your water heater. The first and most obvious step is to determine whether water is dripping, spraying, or flooding. We’ll begin with the worst of these: spraying or flooding. If your water heater is dripping or flooding, skip down the page. If your water heater has flooded and damaged flooring or other parts of your home, be sure to investigate the coverage of your homeowner’s insurance policy. Lever valves control supply to water heater. Note the red main supply valve in the background. Water is spraying from the pipes or water heater. 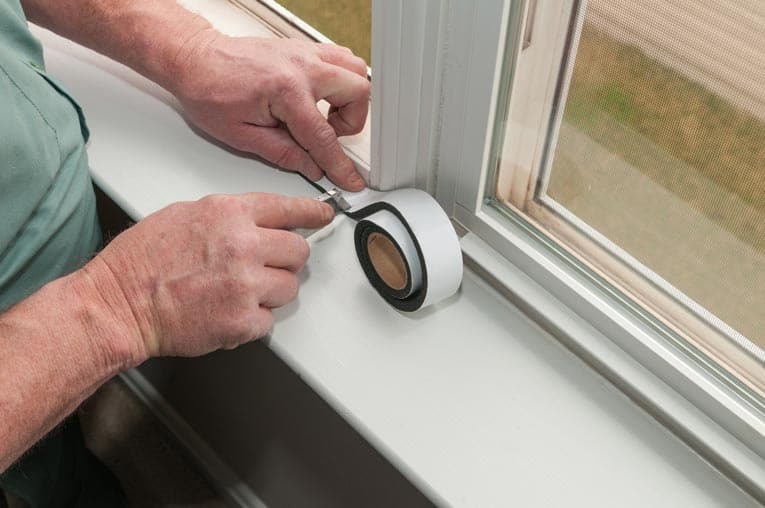 Immediately turn off the valve nearest the supply side of the leak. In some cases, a shut-off valve is located on a pipe right before or above the water heater and may have a red handle. To turn it off, rotate the handle clockwise or, if it is a lever like the one shown in the photo at right, pull the lever 90 degrees. 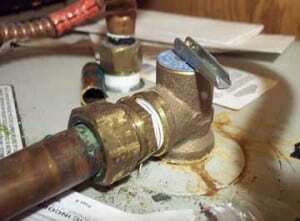 If there is no supply valve for the water heater, shut off the house’s water supply valve. This valve is normally located near the spot where the cold water pipe enters the house. 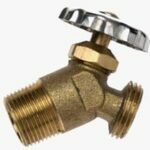 The valve is typically outside in warm climate areas, inside in cold climate regions. See How to Shut Off the Water Supply. If the leak is coming from the fittings or pipes, please see How to Fix Water Pipe Leaks & Problems. Leaks from the hot water tank. A water heater has a limited life span. With this in mind, your tank may be leaking because corrosion has eaten through the metal. If this is the case, you must replace the water heater. If removing the old tank and installing a new water heater is beyond your skills, hire a plumber or water heater pro to replace it. You can get free bids from our service partner, HomeAdvisor. Before you can replace your water heater, you’ll need to empty the hot water from it. Caution: Be careful when emptying a hot water heater—the water may be hot enough to scald you. 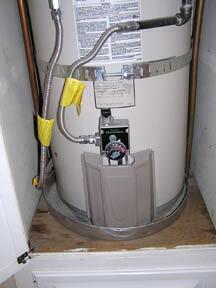 Drain the water heater as explained in the article How to Flush a Water Heater. Water should flow through the hose until the tank is empty. Leaks from electric water heater’s heating element gasket. With electric water heaters, leaks can spring from the gaskets that seal the heating elements to the tank. 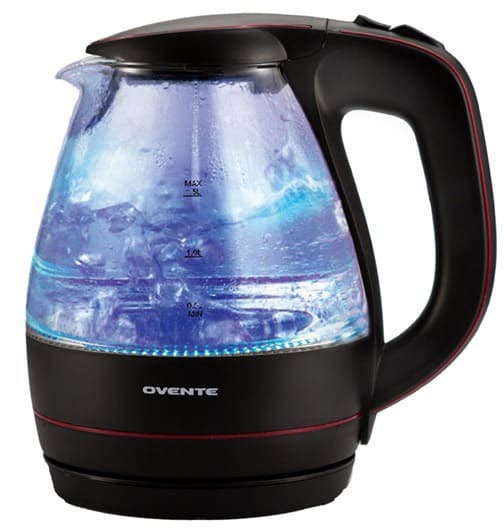 Turn off the electrical power and shut off the tank’s water supply. 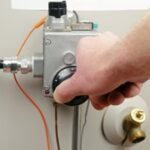 See the article Electric Water Heater Repair and Troubleshooting for information on removing the heating element and replacing the gasket. Also, before turning the power back on, be sure to turn on the water supply to the heater to refill the tank, and run hot water into a sink in your house to release air from the water heater tank. Failure to do so could ruin your water heater’s heating elements. If water is dripping from the water heater, determine where the drip is coming from. A couple of the most obvious sources of a drip are the pressure-relief valve and the drain valve (see illustration). Less obvious leaks may be coming from condensation or from leaky fittings (see above for dealing with leaky fittings). The worst type of drip is the one that comes from the bottom of the tank, indicating that corrosion has eaten through the tank. It’s quite common for water to be dripping from the temperature–pressure (TP) relief valve, which is designed to release water when it senses excess pressure. Excess pressure can be caused by the water heater’s temperature dial being set too high, by the main water supply pressure to your house being too strong, or by special valves that reduce water pressure in your water supply system not allowing for hot water expansion in the tank. In some cases, the TP relief valve itself may be faulty—if it is, it will need to be replaced right away. Consult your owner’s manual for instructions on what to do and see How to Replace a Water Heater Pressure-Relief Valve, or contact a plumber who works with water heaters. A working TP valve is absolutely necessary to prevent excessive build-up of steam that could cause a water heater tank to explode. If you need to replace the temperature-pressure (TP) relief valve, you can buy one online. Drips from water heater drain valve. You can take care of some water leaks simply by tightening the drain valve. If the valve itself is defective, you will need to replace it. Condensation drips. In many cases, condensation forms when cold water fills the tank. and then the condensation drips down. If the problem appears when the tank is first filled or during chilly seasons (when incoming water is particularly cold) but then disappears when the water has had a chance to warm up, this usually indicates condensation. On gas water heaters, condensation can also come from the vent. Check for obstructions in the vent. If you find any, shut off the water heater and clean out the flue. If the problem persists, call a plumber or water heater repair pro.